With the evolution of eBooks and its corresponding readers, you have all the choice today. Gone are the days, where we had to focus on buying only some types of readers. Majorly these were iPads or Kindles. The World has grown more than just these two. You now have different devices which serve the purpose when it comes to people reading different types of formats. One has to say that most of these eBook readers bring a horde of similar features. So the question is what separates them? The simple answer is the make and hardware of the product. Take, for example, Amazon Kindle and Kobo, you practically get same features in them, But then people in Europe and North Asia, prefer Kobo because it offers better durability and battery life. This scenario reverses when it comes to US markets, where Kindle goes the distance. While Kindle dominates some markets, Kobo, Nook, and others dominate others. Each to his own. We today look at the overall performance of these eBook readers and compare them. Although these books bring out different purposes, features and need to the fore, you can bet that these are in no way less than any other. Truly, they hold their ground and bring all the goodness of reading for all ages. It is in this context, we bring to you the best of the lot, and not surprisingly it starts off with well-known Kindle versions and moves to others. However, most of these devices are individually loved and widely used. Thus, the list of eBook readers in no particular order comes as below. These ratings and reviews meet the industry-specific hardware and software needs and bring out the best in the business. People using it swear by it. Children love it. And critics hail it as the Rolls Royce of eBook readers. What more can you need? It’s got the elegance of a Paperwhite eBook reader, and the hardware to power it to the smoothest performance. Thus, power meets style in this effective package of an eBook reader. With glowing reviews all around, you can easily buy this device for any needs you may have with eBooks. When we look at the hardware configuration of the eBook reader, Kindle Oasis truly packs a punch. The device brings out an all-new ergonomic design, dedicated buttons for turning pages and a backlight for reading in the dark. The tapered design is .13” at its slimmest, but it still manages to feel extra sturdy. It’s perfectly balanced for one-hand reading the 6” 300ppi display that offers laser-quality text. It’s magic when Kindle Oasis with such great hardware configuration, manages to come in at less than 5 ounces. Now, that’s revolutionary. Coming to the reading capabilities, Kindle Oasis, is perhaps the best in the industry. Whether it’s black and white comics or lengthy novels, reading on display feels far closer to reading a physical book than a smartphone display. It’s that sharp and frankly, that good. Battery life will vary with use, but Amazon claims the Oasis can last up to 8 weeks on just 30 minutes of reading per day. That caters to the countries in Asia Pacific regions which are always concerned about the battery usage. The 4GB of memory will hold thousands of books with Wi-Fi 802.11 b/g/n connectivity. Amazon’s Kindle Unlimited monthly rate offers one million titles on-the-go, and there are over two million titles priced at $9.99 or less. Ironically, Amazon Voyage is perhaps the costliest option we have on this list. Now, Voyager comes across as the competition to previously mentioned Kindle Oasis. However, the major difference comes when we see the price tag. For all content and mark-ups, Amazon Kindle Voyager is costlier than Kindle Oasis. But don’t worry, you won’t be ripped off. You get a load full of extra features because of this price difference. Kindle Voyage beats most competitors with a slick screen, lightweight design and impressive battery life. After all, this monster of the eBook readers, it can last for weeks without needing a recharge for anytime. And there’s a huge difference when reading on a standard tablet screen versus reading on a Kindle Voyage. 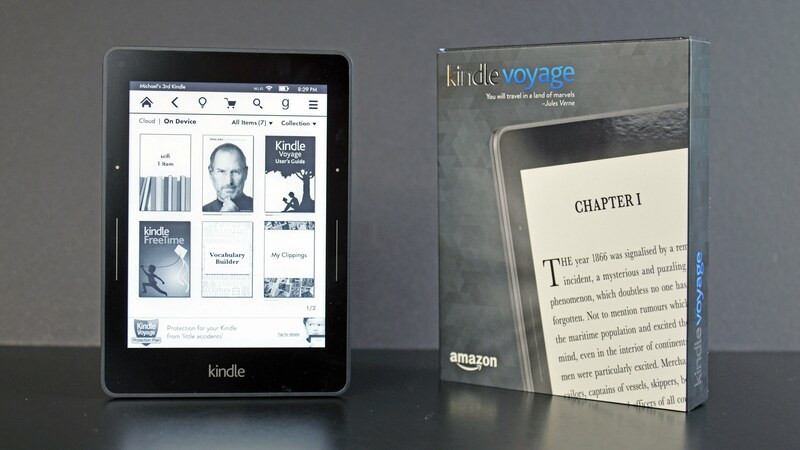 The Kindle Voyage’s 6” uses cutting edge display technology uses E-Ink Carta to achieve the page-like quality. This technology doesn’t hurt your eyes in the same way a LED or LCD does. All the easier for you to go on a bookworm reading spree and complete your bucket list right away. The 300ppi display makes it feel as if you’re reading right off a paper page, with a level of an authenticity that will impress even the most hesitant of print purists. 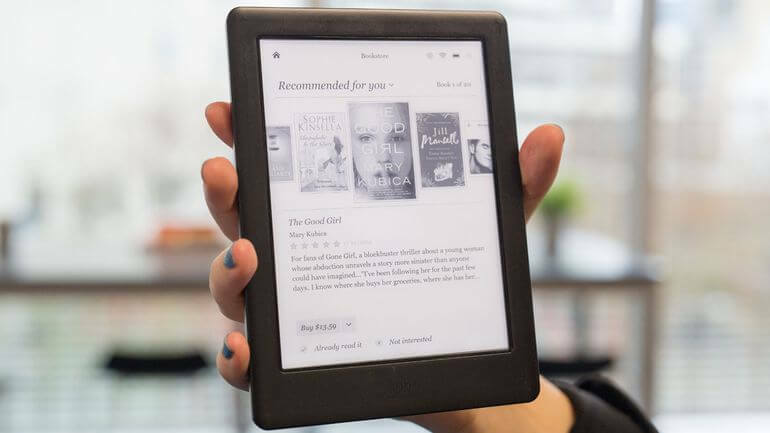 However, you can see that with these many features within the device, it is quite easy to understand that Kindle Voyager comes in a package which weighs a shade around 6 ounces. Overall a Kindle is the only one beating another kindle here. A great way of selling a great deal. The basic question that every eBook enthusiast has when considering a Kobo over Kindle is what does he get as an extra. Well for starters, the Pixel density rate for Kobo Glo is a shade better than Kindle. With around 300 PPI, density, it easily beats Kindle and with good enough package of pixels still present left over. Kobo also manages to squeeze a few more pixels in (1448 x 1072 screen resolution) than the Amazon’s Kindle Voyage. It offers the 4GB of storage space (up to 3,000 books), weighs 12.6 ounces and has a battery life lasting around two months. Now that’s a mammoth amount of battery life for something that is a device which is a bit heavier on the side. So it’s a lot of eBook readers. Kobo is smart to point out how there’s no advertising on the Kobo Glo HD, unlike the Amazon Kindle Paperwhite, which requires the user to see advertisements occasionally. Fourteen file formats are supported, including PDFs, Amazon’s Mobi format and the more open Epub format that isn’t supported on Kindles. The Kobo Glo HD also includes a web browser, and you can even use the Pocket app to read Internet articles on your e-reader. 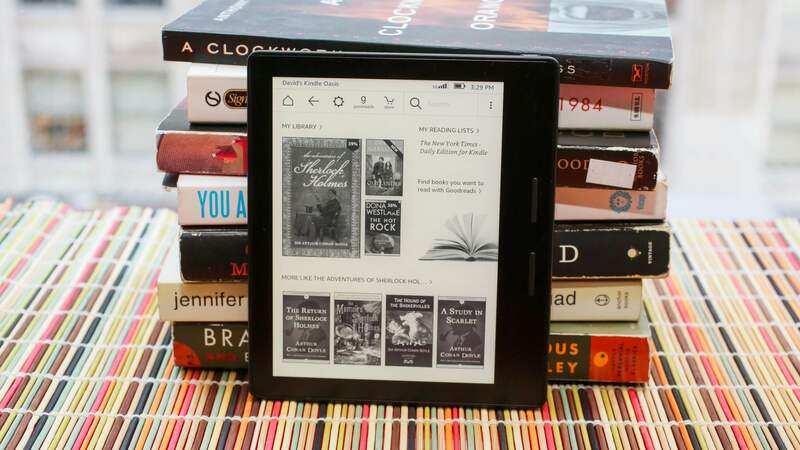 Kobo’s online marketplace may not be as well presented and easy to navigate as Amazon’s Kindle Store, but it now contains roughly the same number of e-books and at comparable prices. Perhaps the only entry in this list of eBook readers, which requires very less introduction, is Amazon Kindle Paperwhite. Of course, it is one of highest best selling devices in the world. Kindle Paperwhite comes as the biggest eBook benchmark. The Amazon Kindle Paperwhite offers a whopping eight-week battery life on normal use and a reading experience that far exceeds that of a tablet. 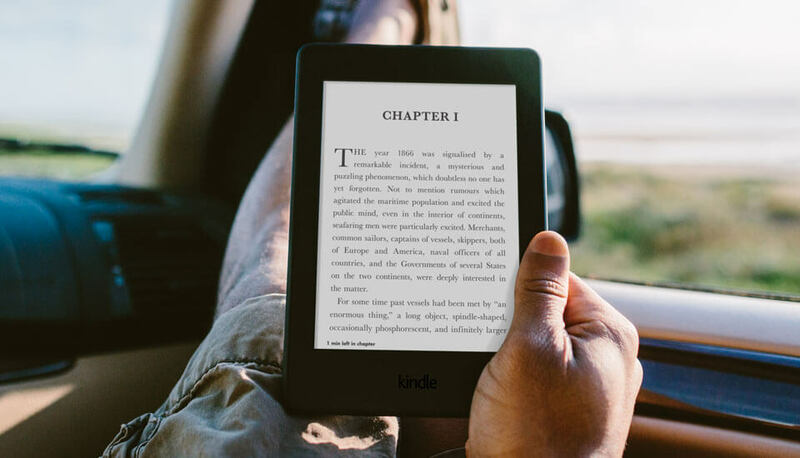 The latest Kindle Paperwhite matches Amazon’s flagship Kindle Voyage at 300ppi. The black and white screen is noticeably crisper than previous iterations, with a more pronounced contrast, and there’s no glare even under direct sunlight. For late-night reads, turn on the four built-in LED lights. What makes the device hit with the readers, is the font specialisation. Of course, we are talking about the font Bookerly has been designed from the ground up to reduce eyestrain while allowing for faster reading. This is not merely advertising fodder; the font is legitimately crisp, modern and easy to read. The typesetting engine has also received an update, so there are fewer awkward, misplaced letters or words that plagued earlier models. The relatively plain Kindle Paperwhite can’t compete with the more expensive Kindle Voyage’s design. At nearly half a pound, it is a little on the heavy side, and there’s no microSD slot. However, with 4GB of internal storage, there’s enough space to store thousands of books. The Kindle Paperwhite is perhaps the most loved eBook reader in the world not just because of that. The basic advantage Kindle has because of its books catalogues which come in sheer millions. One thing which comes to mind when we mention Kobo Aura One is the enormous screen it has for decent eBook readers. This is what makes it stand apart, and makes reading come across as a fun and frolic reading exercise. Kobo’s new Aura One is a sleek, premium e-reader with a 7.8-inch, 300ppi display (the company’s largest). Fortunately, the larger size doesn’t add any additional bulk, as it weighs just 8.1 ounces and is 6.9mm thin. The addition of IPX8 standards allows water resistance in up to two meters of water, so don’t be afraid to read while taking a bath. While Amazon’s Kindle Oasis (the One’s closest competitor) offers hardware page-turn buttons, the One only requires a swipe or a tap on display. An onboard light sensor allows for dynamically shifting screen brightness based on your surroundings. Additionally, the One will skew its lighting for warmer tones in the evening, which will help your eyes during those late night reading sessions. To make your reading experience even more pleasant, Kobo included 11 different font types and more than 50 different font sizes. 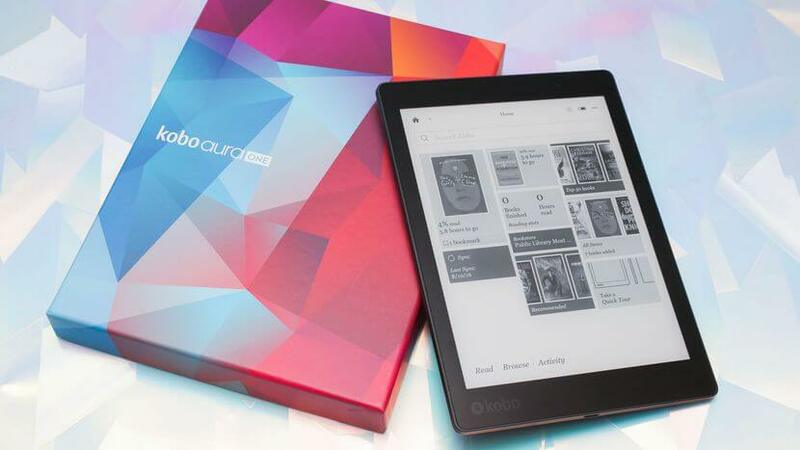 But the face of Kobo Aura One, os really in its huge screen. The 7.8 inches screen makes it up more than ever for anything. If there are a few eBook readers who hold their own before Kindle’s juggernaut, well that the Nook. There has never been more value for money eBook reader, than the Barnes and Noble book reader. The crisp and comfortable 6 inches 300 ppi, display light and more. 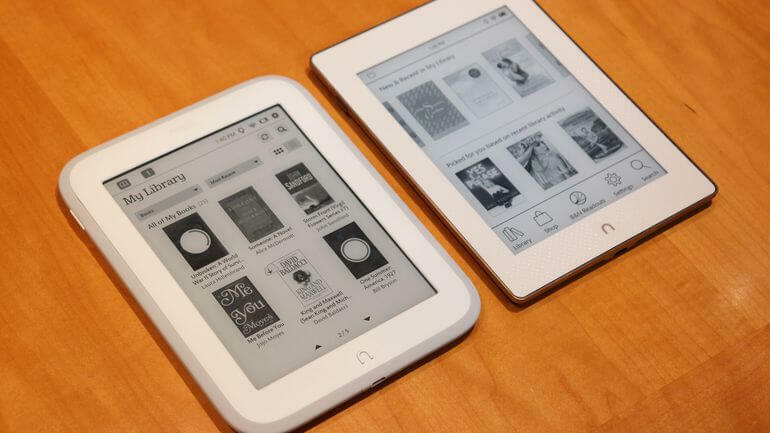 It is even slightly smaller and lighter than the Kindle Paperwhite, yet packs in a screen of identical size and resolution. There is 4GB of internal storage, and you can get around six weeks of standard use between charges. The cool things with this Nook device start with the waterproof capabilities it packs within its petite framework. The device is one of the very devices which support the standards in waterproofing, with IP67 certification. You can submerge the Glowlight Plus underwater for up to 30 minutes without issue, so life’s little accidents don’t slow you down while you’re in the middle of your latest read. The Glowlight reads Epub and PDF files but doesn’t support Amazon’s Mobi format. While Barnes & Noble’s online store is excellent and arguably better than the Kobo store, it doesn’t quite match up to the Amazon store regarding usability. But no love lost for Nook, as it can still hold its ground when it comes to bringing the best of reading capabilities. So that was our pick for the best eBook readers out there. We’re curious as to what your picks are. Let us know, and we’ll put them in with a new list again. Until then happy reading.